Aida A kind of canvas with several strands between each hole, often three. This is also known as Java Canvas, Fancy Oatmeal and Toile Colbert. 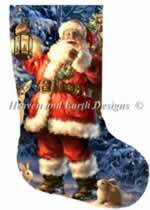 It is usually made of cotton and it comes in widths of 18" to 54". This is sewn in every hole (one over one) with usually 14 to 18 holes per inch (linear) for cross stitch, but there are also 6 to 20 counts available. Back Stitch Backstitching is used to form a line of thread of a different color to the cross stitches that is used for outlining and highlighting. The stitch goes: up one hole; back one hole on top; down; forward two holes below; up a hole beyond the previous one and then back a hole and down to join the previous backstitch, and then repeat. If you are sewing from right to left, each stitch is sewn backwards from left to right. Balger This was the name of a firm that made threads. Hence, many threads are known as Balger Filaments. Today Kreinik has the use of that name. Hence many Kreinik threads have a number starting with a "B". Often they are labeled BF which could stand for Blending Filament or Balger Filament. Others may be seen as, say, B5200. Beads A bead is used instead of a floss stitch to bring out light and other decorative effects (glitter and pizzazz). They are used on such things as costumes, and as stars, wands, jewelry, tiaras. There are many colors, variations, shapes and finishes. Most are round-ish , but bugle beads are cylindrical. They vary greatly in size including: Mill Hill petite beads which are half a millimeter in diameter; Mill Hill seed beads which are one millimeter in diameter; and then there are much larger beads in any shape you like such as stars, hearts, teddy bears, etc. They are usually made of glass or crystal, but could be of wood, metal or plastic. They all have a hole somewhere so they can be attached. Blanc This is the French word for 'white' and is the DMC name for that color, since DMC is headquartered in France. It is sometimes given the number 1. Blending Filament See 'Filament' below. For each of these sizes there are many colors, and within these colors there are several variations as below. Vintage describes a flat thread with an antique finish. It has a muted metallic appearance, and is identified with a 'V' following the color number, as in 002V. Glow-in-the-dark refers to a flat thread that has a subtle glow when exposed to light. This thread type is identified with an 'F' after the color number, as in 051F. Use these threads for Halloween motifs, children's projects, tropical fish, moons, stars, or any whimsical design. The length of time the material will glow depends upon the length of time the material is exposed to direct light. For example, five minutes of direct light equals approximately 10 to 15 minutes of glow time. They are ideal for decorating clothing, but should not be used as a substitute for safety-rated reflective material for visibility at night. Hi lustre refers to a flat metallic thread that has a highly reflective nature. This thread type is identified with an "HL" after the color number, as in 003HL. Hi lustre threads in Kreinik Braids and Ribbons have a bold and glossy appearance. Cord has a tight metallic wrapping around the core. It is strong, durable, and has a high metallic sheen. When made into Kreinik corded braids and corded ribbons, it has a 'nubby' texture, similar to the look of a real metal thread. These threads are identified with a 'C' following the color number, as in 007C. "P" Kreinik Cable™ is a 3-ply gently twisted cord used to create outlines, borders, and exacting definition. It is available in gold and silver in standard put-ups of 10m and 50m reels (other put-ups available by special order). Chart A form of pattern showing the design to be sewn using symbols or colors (representing floss colors, beads, metallic threads and specialty materials) on a graph. There are also supplied a legend, which is the listing of what colors of thread or other materials all the symbols mean, a list of materials and the instructions. This is known alternatively as a Pattern, Graph or Design. Count This refers to the number of threads or holes to the inch (linear) in the fabric. There are two major types: Aida normally comes in 10,12, 14, 16, 18 threads or holes to the inch; Even Weave normally come in 24, 26, 27, 28, 30, 32 threads or holes to the inch. Cross Stitch A form of embroidery where all the stitches are basically the same - forming crosses at each intersection of the strands of the fabric. Note: All bottom stitches should go in one direction, and all top stitches should go in the opposite direction. "Counted" cross stitch is where the fabric is plain (unpatterned), and a pattern or design chart, the graph, shows where each stitch goes. The graph is a grid (of squares representing all the holes of the fabric) showing the relative position and color of each stitch. A legend shows the conversion of symbols used on the chart to the color numbers of the threads, beads, etc. to be used. This is sometimes called Full Counted Cross Stitch. "Embellished" cross stitch has some of the background, or the less significant parts of the design, pre-printed so that you only have to sew the main features in cross stitch. "Stamped", or "Printed" or Pre-printed" cross stitch is where the design is printed on the fabric. You see the complete design as X's on the fabric. The legend (or graph) shows you what color to use for each X.. All the stamped X's are sewn over so that they do not show in the end, and they usually wash out. This can be done on almost any material and you do not count holes. The crosses are usually much larger than counted cross stitch crosses. Ecru This color is similar to the color of raw silk, cotton or linen. Evenweave This is a description of a fabric which is smoother than Aida or most linens. It is smoother because it is made of half natural fiber and half a man-made fiber like polyester. It usually has one strand between each hole as it is most like to the linens. Cross stitching is usually sewn over two strands of evenweave, in every other hole (over 2), because it has the higher counts - 24 to 32 threads per inch. Faces and hands are often sewn in every hole (over one) for more detail. Embellished Cross Stitch See Cross Stitch above. Fabric The material on which cross stitch is sewn. Often the fabric is linen which comes in many colors and many counts. It can also be made of cotton, man-made material, or a mixture of natural and man-made materials, or even perforated paper or plastic. Only fabric especially made for cross stitching should be used for cross stitching, because the even spacing of the threads is very important. To sew on other fabrics you can use waste canvas (see below). Filament This is like a metallic thread that has been flattened. It comes in many colors, it glitters, and golds and silvers are popular. It is normally sewn using two or three threads of filament in a needle, or with one strand of filament and one or two strands of floss. It is known as a 'blending filament'. Floss Mostly this refers to a type of cotton thread. It comes in skeins of 6 strands loosely twisted together, and with a color-coded number. It is normally sewn in cross stitch using only two or three strands in a needle. There is also silk, rayon, metallic and nylon floss. Floss is used as the main ingredient in sewing a cross stitch designs. Most cross stitch designs are sewn with only floss. Shadows - normally in the same direction as the top half of the cross stitching, or it can be the underneath of a backstitch when it goes in the opposite direct to the backstitch. Back ground shading - then they must all be the the single top stitch of the cross. This way they will match the top stitches of the cross stitches you have stitched in the rest of the design. Lightening - half stitches can be used to make parts of the design lighter. Jobelan A fabric made of a mixture of materials usually about half cotton and half man-made. It is more like linen than Aida, and feels softer than either of them. It comes in 16, 20, 25, 28 and 32 counts, and is an 'evenweave'. The codes with a "K" are for kits with everything but without the floss. If there is a letter after the "K" or "F" it denotes the type of fabric. Linen A fabric made of flax, which has one strand between each hole. The difference between linen and non-cross stitch fabrics is the consistency of the distance between the holes across the whole length of the cloth. It usually has counts of 24 to 36 holes to the inch, but I have seen counts from 10 to 40. Linen is usually sewn over two holes, so that detail can be sewn over one hole for greater definition of the detail. Some linens from Europe are made of cotton. Needlepoint is very similar to cross stitch, but it only uses half cross stitches. 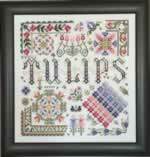 All the needlepoint designs that we sell are on painted canvases. The whole canvas is painted, and I think that everyone is fully covered by stitching. Some are sewn with floss and some with yarn (wool). The canvas has larger holes than linens and Aidas, and hence the background would not look good if left un-sewn. Generally, all these needlepoint kits could be sewn as normal cross stitch. You would have to watch out for how much floss you would need to use. In England this is known as "Tapestry", or "Half Cross Stitch". Over 1, 2 or 3 There are several expressions like this that refer to how many holes you skip after bringing the needle up through a hole until the needle and thread goes back down again. Aida is sewn in every hole normally. That means up one hole and down the next hole diagonally from it. This is "over 1". Linens and Evenweaves are normally sewn "over 2". That means bring your needle up one hole, pass over two threads, horizontally and two threads vertically and go down the hole which is two holes diagonally away. Some designs for evenweave include sewing over 2 and over 1. This happens when the designer wants more detailed definition for such features as faces and hands. If you want to make a picture larger you can sew over 3. 32 count would then only have about 11 stitches per inch. Quarter Stitch Quarter stitches are just that, it is a half of a half stitch. The little stitch ends in the center of the normal full cross stitch. They can go in any diagonal direction depending on what the chart says. They are usually used to soften outlines or where two colors meet. Hence on a linen that stitch is over one hole, not over two holes. This also means that when sewing Aida, where there is no a hole half way, you have to come up through one hole, and return the needle through the thread, half way between the holes. Use a sharp ended needle rather than a tapestry needle for this. This is much more difficult and not recommended, especially if you have a great many of them. Three-Quarter Stitch The is literally a half-stitch plus a quarter stitch. Please see above for both. I do the half stitch first, and then the quarter stitch. Tweeding Using two or more different floss colors in the same needle, usually one strand of each color. ( example: DMC 501 & 502). This is made for cross stitching on pieces of cloth or clothing which are not made of fabrics suitable for cross stitching. Waste canvas has counts of anything from 6 upwards, and can be used like Aidas or evenweaves. The waste canvas is attached to the parent article, and cross stitched. At the end, the strands of waste canvas are pulled out, leaving the pattern on the parent piece. Do not use a sharp needle or you will pierce the canvas and not be able to pull the strands out.